Gum disease is commonly referred to as “periodontitis” or “periodontal disease” or “periodontal gum disease.” A dental hygienist or dental professional (periodontic dentistry)may have recently informed you that you have this infection. However many people don’t really know the difference between periodontal disease and other common mouth issues like gingivitis. Did you also know that periodontal disease should be treated immediately and simple brushing and flossing won’t remedy the problem by themselves? Many people are surprised to discover that periodontitis is the #1 cause of tooth loss for most Americans! There is also evidence that there is a relationship between periodontal disease and other systemic issues. In fact, recent studies have shown a causal relationship between periodontal disease and health issues like diabetes and cardiovascular disease. Gum disease is tenacious. 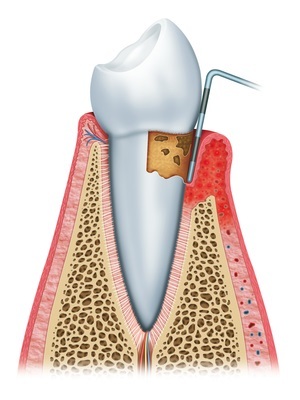 In the early stages is starts out as plaque, an sticky film that develops on the teeth and hardens into tartar. Tartar accumulates and provides a fertile home for bacteria that begins to attack the gums. This is also known as Gingivitis. If left untreated, Gingivitis progresses into Periodontist and will eventually destroy the not only gum tissue but the bone that secures your teeth in place. Early warning signs of this problem are bleeding gums and bad breath. The disease progresses slowly and there is often no pain, but eventually you will start to loose teeth. However, tooth loss is only one result of gum disease. Research has uncovered a link between the presence of gum disease with stroke, heart disease, and diabetes – with pregnant women at an increased risk. Gum disease weakens the body’s immune system. Most people don’t seek treatment for dental issues, as they fear the possibility of painful dental surgery. However, these days modern dental treatment is relatively painless. When you wake in the morning is your jaw often sore? When you are chewing, do you feel like your jaw is mis-aligned? If you you answered yes, then you may need an occlusal adjustment. Occlusal adjustment will help to correct your bite, by aligning the teeth. This is because loose, shifted, crowded, or missing teeth are often the source of bite issues. Once the procedure is completed the result will be the elimination of irregular pressure within the mouth. After adjustment your teeth will interdigitate properly. The procedure itself is relatively simple and results in little discomfort. The adjustment is accomplished with the use of a dental drill, equipped with a fine filling tip. As part of the adjustment process, a removable mouthpiece may also be prescribed, this will help protect the surface of the teeth, and allow the jaw muscles to relax after the procedure. – Who should consider an occlusal adjustment? People with shifting or loose teeth may experience issues with their bite. Those who frequently grind or clench their teeth, may develop an uneven bite with poor pressure distribution, this can be corrected with occlusal adjustment. Sensitive teeth problems can also be resolved through occlusal alignment, since this treatment greatly reduces pressure placed on sensitive teeth. Modern equipment allows dentists to easily identify which teeth need adjusting. A computer scan is taken of the mouth, which analyzes a patients bite in seconds, and registers even the slightest pressure issue. Dr. Lamb is then able to review this data and make precise adjustments where needed, which guarantees a more comfortable bite with minimal wear on the teeth. Loose teeth can be bothersome, especially when biting or chewing. Loosened teeth pulling away from the gum can generate almost unbearable pain. In some cases, you may be asked to wait a long time for the tooth to become loose enough to be removed or grow stronger. Loss of gum tissue, an injury, recent dental procedures, or misalignment can can all cause teeth to become loose. Periodontal Splinting is a newly developed technique that secures weak teeth into a single unit, that is both stable and strong. This treatment is most frequently performed on front teeth. It’s a simple procedure that utilizes a composite material to attach loose teeth to their stronger neighbors. This procedure is so effective that has become quite popular with modern dentists. There’s no reason that you should have to live with the pain of loose teeth. If left untreated Gingivitis can lead to serious deterioration of the teeth and gums. Just knowing you have gingivitis can be stressful! Yet treatment for this condition is safe, effective, and can be performed right in your dentist’s office. As we learned earlier, plaque and tartar provide a fertile environment for bacteria thrive. When bacteria attacks the gums it can cause inflammation and bleeding. You may notice pain or bleeding after brushing your teeth or after eating. This are indicators of early stage gingivitis. A dental hygienist can treat gingivitis by simply scaling and polishing the teeth. If left untreated gingivitis will progress, and your roots will need planing. Root planing is slightly more intensive than scaling. Scaling simply removes tartar from surface of the tooth. Root planing requires the smoothing of teeth root surfaces. It is a non-surgical procedure which requires no anesthesia, and is performed in a dentists office. In general root scaling is very easy to accomplish, but if your gingivitis is advanced a local anesthetic may be applied to numb the area and prevent discomfort. These deep cleaning procedures are usually one section at a time during at least two separate appointments. This is so your gums have enough time to heal between treatments. 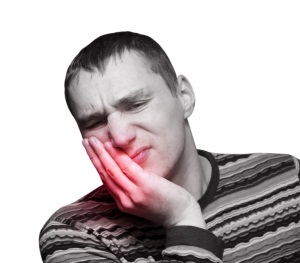 If you are experiencing pain, discomfort, or bleeding of the gums don’t hesitate to contact your dentist immediately. The sooner you schedule an appointment for treatment, the better your chances are avoiding serious gum disease.